If you look carefully at how things are actually made in China - from shirts to toys, apple juice to oil rigs - you see a reality that contradicts every widely-held notion about the world's so-called economic powerhouse. From the inside looking out, China is not a manufacturing juggernaut. It's a Lilliputian. Nor is it a killer of American jobs. It's a huge job creator. Rising China is importing goods from America in such volume that millions of U.S. jobs are sustained through Chinese trade and investment. 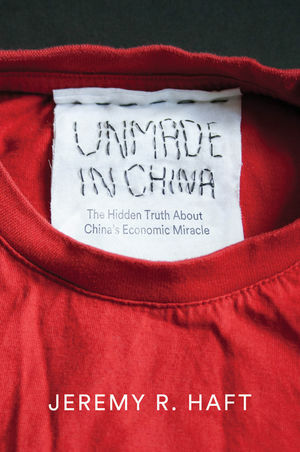 In Unmade in China, entrepreneur and Georgetown University business professor Jeremy Haft lifts the lid on the hidden world of China's intricate supply chains. Informed by years of experience building new companies in China, Haft's unique, insider’s view reveals a startling picture of an economy which struggles to make baby formula safely, much less a nuclear power plant. Using firm-level data and recent case studies, Unmade in China tells the story of systemic risk in Chinese manufacturing and why this is both really bad and really good news for America. Jeremy R. Haft has been starting and building companies in China for two decades across the breadth of China's economy - from light and heavy industries to agriculture. Haft is the author of All the Tea in China: How to Buy, Sell, and Make Money on the Mainland (Penguin, 2007), which presents best practices for importing, exporting, and doing business in China. An adjunct professor at Georgetown University who lectures in both the Walsh School of Foreign Service and the McDonough School of Business, Haft's analysis on China trade has been featured in such media as National Public Radio, The Wall Street Journal, The Financial Times, Forbes, The Huffington Post, CNN, CNBC, Fox, NBC, CBS, and ABC. "China's economic future will determine the world's future. This important book makes new factually grounded arguments about the challenges China faces. Its arguments deserve attention from anyone with a stake in our economic future." "Challenging conventional wisdom of China's economic supremacy, Haft deftly and entertainingly uncovers how systemic risk in China's economy actually creates millions of jobs in the United States. Unmade in China is a must-read for global policy makers, business leaders, and anyone who wants to understand the US−China trade relationship." "A clear-eyed analysis of China's fragile economy and its impact on the USA." "A systematic, mind-changing, and remarkable read which debunks the myths about China's economic supremacy and provides an optimistic rallying cry for US companies. Outstanding!" "Jeremy Haft's "Unmade in China" explains why the idea of Declining America vs Rising China is simplistic at best and downright deceptive at worst. He cuts through the emotional responses to China's "rise" to detail why that country's unregulated manufacturing poses important risks—and big opportunities—for Americans. This is a must read for anyone who dares to look to the trees inside China's expanding forest." "A fresh perspective on great risks posed by rampant non-compliance in product quality, process control, management protocols and governance in China dependent global supply chains, which also throws light on the opportunities for US-made products and services in China. An insightful book for anyone interested in doing business in China." "Finally, a clearheaded book that cuts through the China hype. With refreshing clarity Jeremy Haft challenges the hackneyed narratives about China's economic might to deliver an eye-opening and corrective analysis on what we thought we knew about everything 'Made in China.'" "This book is fluent in style and full of informative case studies, making it suitable for the general public as well as researchers and policymakers who are interested in a fair reading of China's economy and its increasing impact on global society."